We're celebrating the PlayStation community with a new limited edition PS4, discounted PS VR bundles, savings on big games, and lots more. 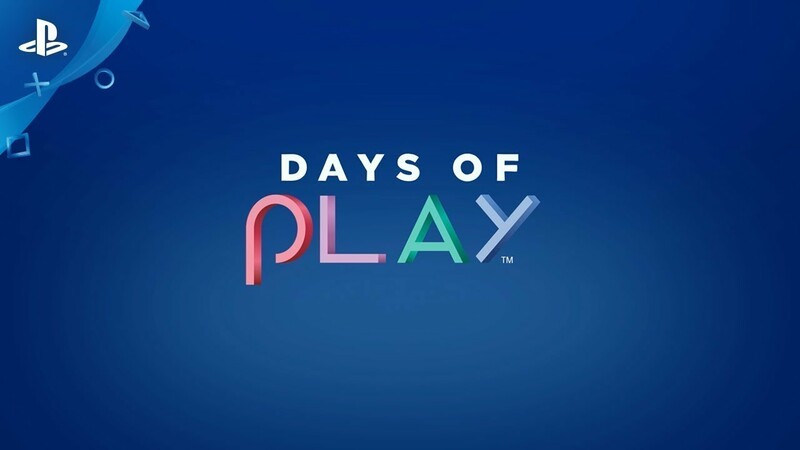 We’re very excited to announce that we’re bringing back Days of Play this year – a global promotion that celebrates the passionate PlayStation community and your endless support by offering epic deals at participating retailers across the US and Canada, while supplies last. From June 8-18, we will offer discounts on the MSRPs of hardware, peripherals and PlayStation 4 exclusive games. Additionally, we will be introducing a Days of Play Limited Edition PS4 system for $299.99 USD / $379.99 CDN (MSRP) on June 8. The limited-edition console features a Days of Play Blue color, a 1TB hard drive, with a gold PlayStation symbol design placed at the center of the top surface. The system comes with a matching DualShock 4 wireless controller, which also features subtle gold PlayStation shapes on the touchpad. This special Days of Play PS4 will be available for a limited time only, so don’t miss out! *Update: This post previously listed the CDN price for God of War as $59.99. It has since been updated to reflect the correct price of $66.39 CDN. We hope all of you can join us in celebrating the PlayStation community during this special promotion! FYi. The link for the PS Store Catalog titles goes to the 12 month PS + page. Because it hasn’t started yet maybe? Will there be an E3 Theater event this year? They’ve been really quiet on this. I’ve messaged them on every social media platform and they aren’t talking. When they said this years E3 would be different, guess not having a theater stream is what they meant. They are having one. In select Theaters. Tickets go up on June 5th and they are free. You have to come one her to get them. https://blog.us.playstation.com/2018/05/31/playstation-e3-experience-2018-live-in-theaters-june-11/ Just in case you want to look. It has the city’s and theaters that will be airing it. Can we get 2 controllers with the limited edition, like offered in Europe? $300 for a 500GB standard console is not much of a deal. I think it is extremely gaudy, but I suppose it is meant to be a collector’s piece. I’d prefer that they drop the 1 TB slim model down to $200 as it often sells around Black Friday. I’ve been thinking about getting a second PS4, and God of War had the fans on my 2015 model screaming like jet engines. If I had a 4K TV I would probably jump on the Pro at $350. At this point with Sony saying the PS4 is starting its Swan Song, I will just hope that the PS5 is backwards compatible and plays PS4 games at the level of a PS4 Pro. Well it appears I didn’t read the article closely enough. Bravo Team isn’t worth it. Unless you’re a glutton for punishment. Same thing goes for The Inpatient unfortunately. When will and which store will have the PS4 day of Play edition? Can we get a discount for a PS Now membership? Glad I bought plenty of move controllers back when the ps3 was at its wit’s end for $25 each! The new Move controllers have twice the battery life as the old PS3 models. Would have been tempted if the special edition was a PS4 Pro, surprised it isn’t as I would assume most people interested enough to want to grab a special edition console would also be engaged enough to want it to be a pro model. The video shows Horizon Zero Dawn Complete Edition but the Blog only references the base game. Which is it? The video says “starting at” $19.99 which means at least one of the shown games is that price, not necessarily all of them (it shows MLB: The Show, too, which says $39.99 on this page). Love the blue/gold PS4 look (much better than the GoW tripe), too bad you didn’t make the Pro the same. I don’t have a reason to upgrade my PS4 nonpro, but a blue PS4Pro might’ve been enough to make me cry ‘uncle’ and get one…. It says MLB is $19.99 in the video, but in the article it says $49.99? So looks like the specs are different across regions – EU gets 500Gb and 2 controllers, while NA gets 1Tb but only a single controller. Will the LE controller be available separate from the console? but that controller has me drooling. I’ll jump on a 2 or 3 of those I can get them! Is the PS Vue deal for everyone or just new subscribers? I need one of these retailers to be Amazon. If so, I’m in for a PS4 pro. I have gift cards. I hope they bring back the $99 deal for PS Now. Is all of this an online offer or will it be available in stores such as Gamestop? Could we please get the Pro in that blue design? Any chance the annual PS Now subscription for $99 will be offered again? Where can we buy the days of play limited ps4 slim? So where will i be able to get the ps4 pro on sale at. Gamestop, Amazon, or playstation store website? Best Buy will price match any other store, so no matter what you can just go there. Just have proof that PS4 Pro is on sale in hand. Who exactly are the “participating retailers” in the US? I agree with others – the limited edition should have come in a Pro version as well. Or, maybe you could at least offer it as a Pro skin? Where I can buy the blue controller? ola…that is good …after fail of june free games ,this must be high.awainting for . Seriously?? show me where the deal is? Ever since I bought the PS4 I don’t see the hype behind it. I think Microsoft has better titles for it’s platform and who the hell offers one game system special with one remote then in another geographic location others get 2 remotes? The fire sales are just as bad. Half the titles are garbage. And seriously…PS Plus and PSN…..why not have everything under one roof? Well i’za sowwy Massa, I seez weez jus stewped. Slaves of the machine of idiocy. If you don’t like it, why are you here then? Go back where you came from…! HAHAHA quit trollin everybody with that talk. Turn off your auto PS+ renewal, during days of play. Last year, I was victim of that, and paid full price . The vertical stand is on Amazon. I am so utterly disappointed that the PS4 Pro isn’t being sold with the limited edition Days of Play Blue theme. I would totally get the Pro if it was the blue and gold version. I really don’t see why anyone would get the PS4 Slim, over the regular ps4. This just seems like such a wasted opportunity. it seems i’m not the only 1 asking this.. why is there no CE for the pro? how many ppl are still on the fence about getting their first ps4 at this point? Not many people are just going to double up on a base ps4 for $300. just my opinion. This was a golden opportunity to get many ps4 owners to finally upgrade to the pro. missed it this time sony. definitely getting HZD tho!! SONY announces “Days of Play” and i wount be able to enjoy discounts because PSN GIFT CARDS ARNT AVAILABLE ON AMAZON STORE ! Check G2A and get $50 gift card for 46$. Who needs amazon. The days of play It will be available for LATAM?, Honduras to be more specific, And in which store I’ll find what I’m looking for? where i can buy? amazon? the sony platinum headset is on sale ? Can’t wait to get HZD. Is the sale on PRO on EU too?So far only see Canada and N.A packing the PRO sale which is the one i care about. i havent seen an answer for this but – are the game sales going to be digital and physical or physical only? I’d love to pick up a few games there digital at those prices. Why not its another system to add to my collection I already have 6. What would one more hurt for getting the Blue Play of Days one and IF they do come out with the Marvel Spiderman PS4 Pro that will be also added to my collection as well. when will the ps4 pro release with the discount ? sooooo…..when is this going live?